If you don’t enjoy writing, website copywriting can seem like an uphill struggle. With any website copywriting project, there’s a lot to consider. You’re not just writing for human beings (which of course is your first priority; it’s humans, after all, that buy things from you). Website copy also needs to be optimised so that search engines have a clear idea of what you’re selling. You have to get the tone of voice just right for the visitors that come to your site, and for the subject you’re writing about. And if you’re selling products that can be found on other websites, unique product descriptions – rather than the same old manufacturers’ blurb your competitors are using – can help you stand out from the crowd. We’re happy to work on website copywriting projects for all sorts of organisatons in all types of industries. 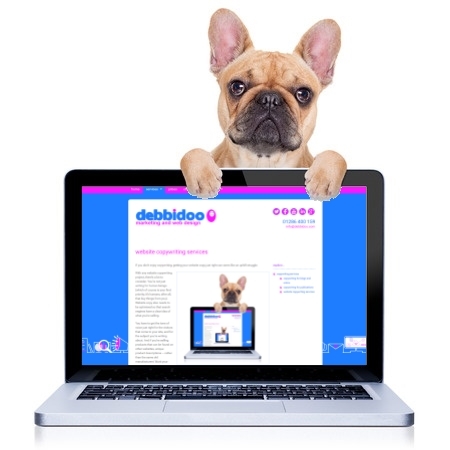 Whatever your line of business, when you hire debbidoo for a website copywriting project you can be sure we’ll work closely with you to understand your brand, your keywords, your products and your customers – so you get exactly the sort of website copy that’s right for you. what does website copywriting cost? We charge £40 per hour for our website copywriting services. But if your website copywriting project is large, or if you need website copywriting services on a regular basis (for example, if you’d like us to write product descriptions whenever you add a new product to your e-commerce website) we’ll be happy to talk to you about fixed fees or billing at a reduced hourly rate on a sliding scale (you can find out more about our sliding scale on our prices page). If you’d like us to provide a no-obligation quote for your website copywriting project, or if you have any questions, please get in touch.